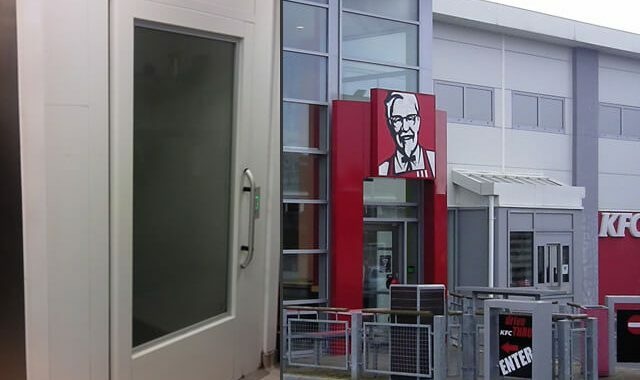 As a major fast food outlet in a busy residential area of Belfast, KFC needed to provide disabled access to its upstairs restaurant floor, not only for wheelchair users, but also for customers with young children. The design of the lift needed to complement the modern aluminium and glass design of the rest of the building. We recommended our Vertical Platform Lift. The modern aesthetics of the lift perfectly complemented the design and image of the building itself. As the physical demands on the lift will be high, we considered that the nut and screw drive will provide the required smooth performance and the necessary longevity, demanded by our customer. Fast food is all about functionality. However by choosing a lift with sharp, modern design it blended into the contemporary style of the building, while meeting the day-to-day needs of customers. 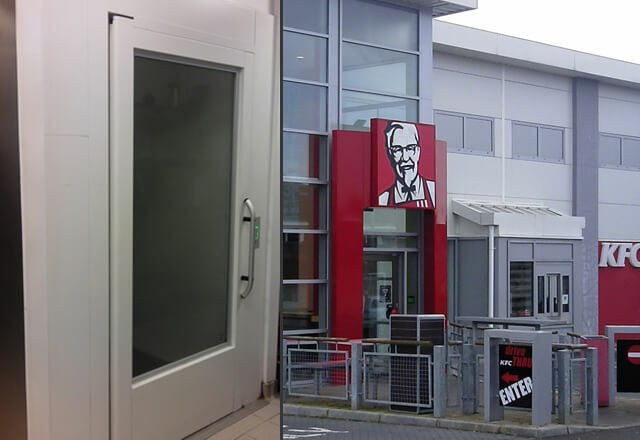 Its mechanical design will ensure that it keeps on working for at least as long as KFC continues to attract customers to this restaurant.